Today I’m going to the London Film and Comic Convention at Earl’s Court, and since I’m gonna be in London anyway I thought I’d go along to the BritTours Doctor Who tour. We have to meet at Temple station on the Victoria Embankment, and the tour is by bus so we can take in so far flung locations. First up is St Peter’s Steps, which lead up to St Paul’s Cathedral. 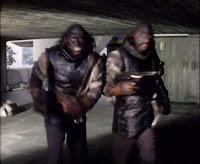 This was seen in the cliffhanger to an episode of The Invasion, the 1968 Cyberman story with Patrick Troughton. I had been here a number of times before, and seen it prior to the remodelling that took place which saw the office block to the right change from glass to red brick; and the construction of the Millennium bridge, which spans the Thames to Tate Modern close to The Globe Theatre on the south bank. 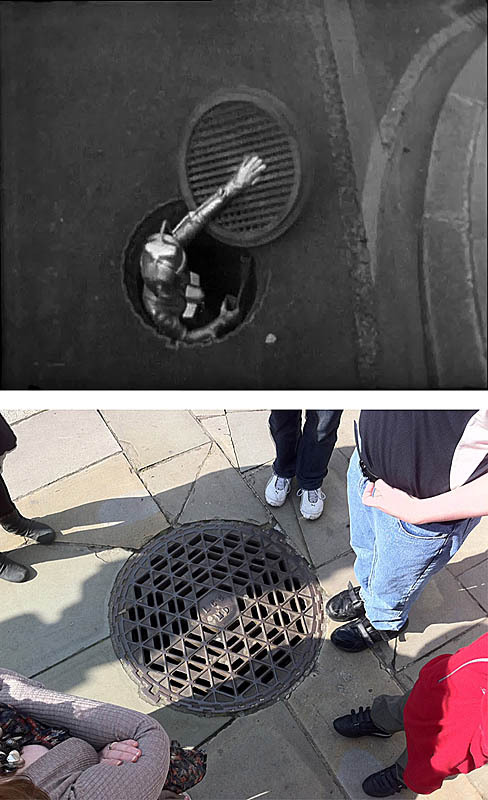 What I hadn’t seen before was the manhole cover out of which the Cybermen are seen burt at the start of the sequence; and the pub further up the steps where they are seen walking past at the end of the scene. The street has the most amazing name - Knightrider Street, which substantially pre-dates the American 1980s tv show I’m sure you are thinking of right now! From here we took the bus out to Wapping, which had been used extensively during the 1977 Tom Baker story The Talons Of Weng Chiang. I had never been here before, so was quite keen to see how it looked and what had survived. To my surprise the area was pretty much unaltered, bar some sympathetic restoration work into expensive homes and apartments. 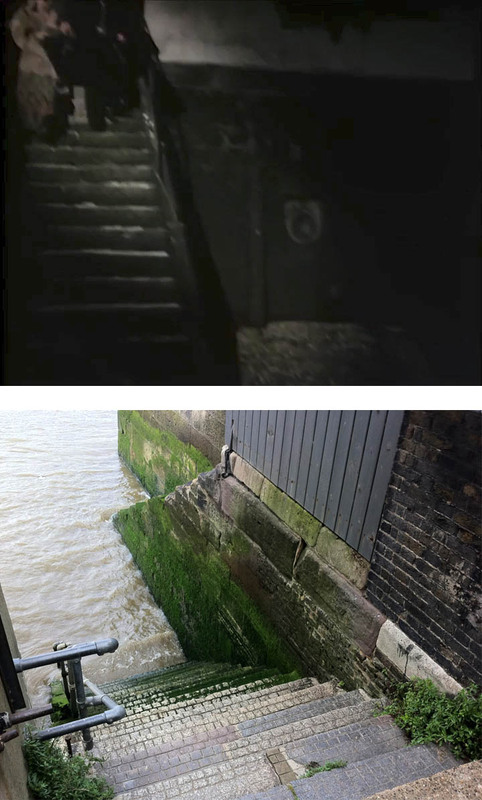 First we took a look at the Wapping Steps, which are down a narrow alleyway beside a pub. 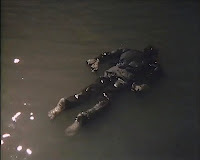 They lead down into the Thames and it was here that an old crone had found a body floating in the river, helped by a couple of Victorian police officers. Apparently, the real police were in attendance to assist with any crowd control and they officers asked to borrow the fake body after filming. They placed it somewhere and called the station to mobilise a rookie officer who was called out to investigate - much to the amusement of the rest of the force! 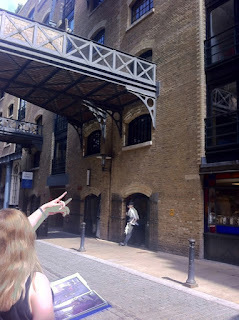 We then walked the few yards to Wapping Pier Head, which is divided into four quadrants around a central gated park, akin to many of the squares in the Bloomsbury area of London. Two of the quadrants were used: one as the exterior of the morgue; and the other as the exterior of the house of one of the lead characters. For the latter the crew needed the street clear of all cars, but on the day found that one resident had gone away on holiday, leaving his porsche parked outside. To save their shot, the car was covered in a tarpaulin and then dressed with straw and horse manure making it look like a massive pile of something unmentionable - but in a car shape! It’s one of these wild stories that only once you look at the shot form the episode you realise is it totally true! Back onto the bus we then headed south over the Thames at Tower Bridge to visit Butler’s Wharf on Shad Thames. Anyone who’s read my tour write-ups before will know this is my absolute favourite location in London, and I will take any excuse to walk its cobbled road, so this was a highlight on the tour (aside from the locations I had never visited before). We looked around at the locations used and I was a bit disappointed the tour guide didn’t seem to know it that well and was sure which window the Dalek had been pushed from during filming! Feeling obliged I helped point it out as well as a couple of other points of interest along the way. She didn’t seem to mind and I quickly returned to the back of the group so as not to hijack the tour further. 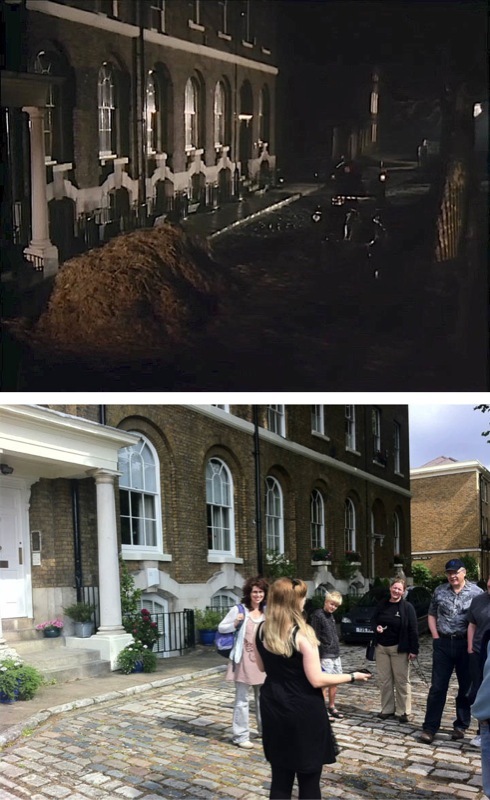 Next up was the back streets of Waterloo where the pitched battle had been staged between the Dalek factions in Remembrance Of The Daleks. These are some amazingly untouched back streets in London. They look absolutely no different to how they appeared in 1988, and I’m sure at that time they looked no different from when the episode was set, November 1963. I hadn’t been back here since taking Mark Ferris on his tour last year, so I was curious to see of the chalk-marked graffiti we found was still there. it was, along with a couple of other instances I hadn’t noticed first time around. One of the tour group noticed my interest and asked what they were. I explained and said how we had found them around, but had no clue as to why they were there. Very curious. 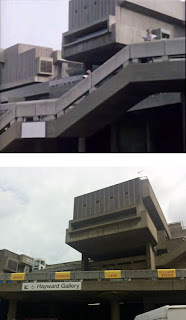 From here it is a short ride to the Hayward Gallery in the South Bank Centre, which had been used in 1973 for the Jon Pertwee story, Frontier In Space. I was aware the area had been used, but wasn’t too sure of the specifics of which bits appeared and how. I was surprised to find it was so localised around the gallery, given the sprawling nature of the South Bank Centre itself. The Hayward Gallery is still very recognisable from the episode, though a steps leading down from it have been totally removed and the upper walkway extended across. The guide explained how the BBC ask for the area to be kept clear, but were told that was not possible. On the day they found the area beneath the gallery was frequented by vagrants and drunks who were reluctant to move on. They soon fled, however, when a couple of the actors dressed as Ogrons laundered they way towards them! 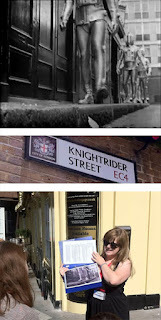 We did plan to visit John Adams Street, which doubled for Downing Street in Aliens Of London, but there were a number of road closures which despite our best efforts we could not seem to circumvent. So instead the bus pressed on and we headed for the Brandon Estate in South London. 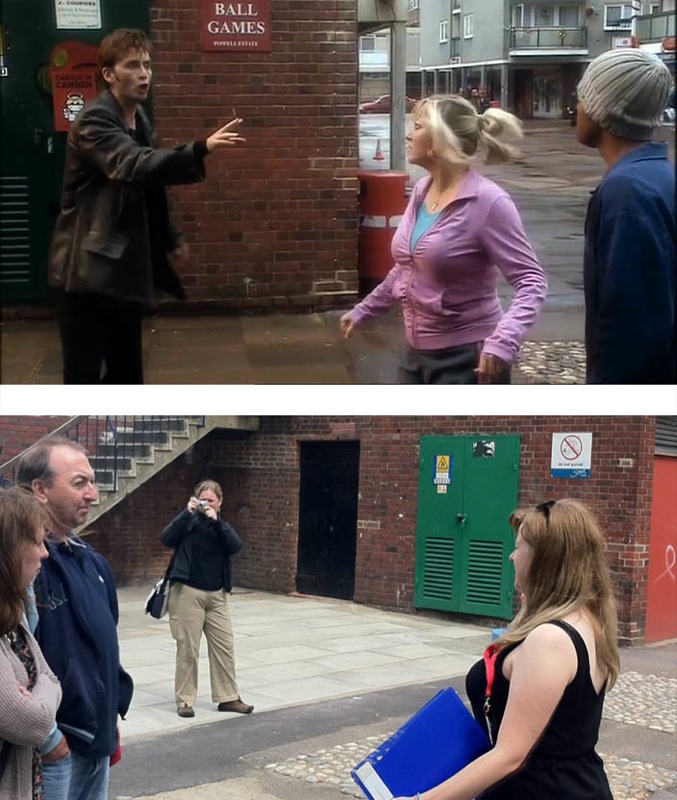 This is the location used to establish the home of Rose Tyler and appeared in numerous episodes from Rose and Aliens Of London in series one; to The Christmas Invasion, Army Of Ghosts and Doomsday in series two; before reappearing in The End Of Time Part Two for David Tennant’s final scenes. The location is recognisable, but somehow it seems smaller in real life. Of particular interest is the corner where the TARDIS crash landed in The Christmas Invasion, and where The Doctor watches Rose walk past at a time prior to meeting him at the close of The End Of Time. At this point my jaw dropped. 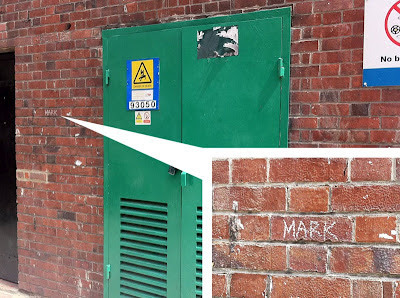 On the redbrick wall beside the doors was the chalked name MARK - exactly as I had found the year before in Waterloo’s Windmill Walk! That sorta clinched it for me - whoever had written this MUST be some form of Doctor Who fan. 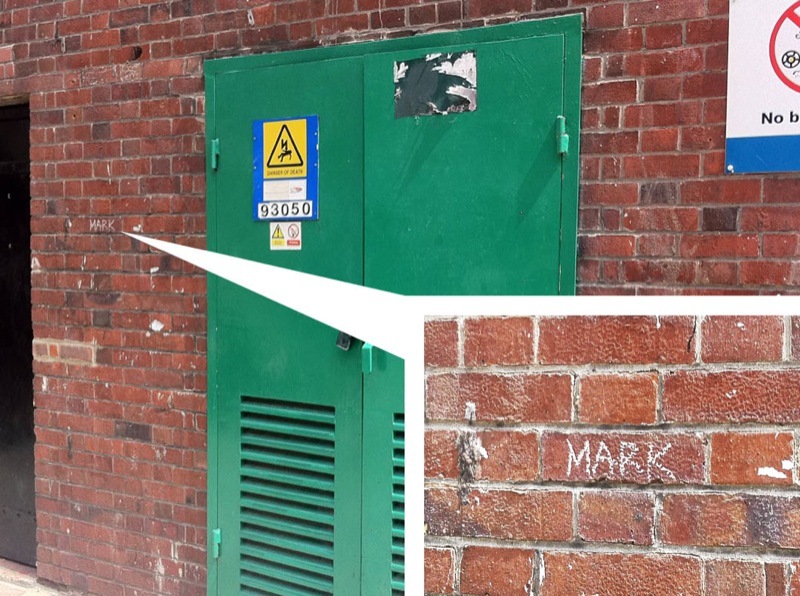 What are the chances that two locations associated with the series, some 5 miles apart, would bear the same hand-written graffiti? I wonder Who was doing it?